Children learn by touching, tasting, feeling, smelling, and listening. They love to help prepare food and cook because they can use all their senses. Children like to eat the foods they make. Plan ways the children in your care can help you. Be sure to consider the age of the child. 1. Good cooks of all ages always wash their hands before cooking. 2. Tell children to wait until the dish is done before sampling it. This will help prevent illness. 3. Expect spills and messes. 4. Children have short attention spans. Give them quick, simple jobs, and give instructions one at a time. 5. Children get excited and forget. Repeat directions as often as needed. 6. Young cooks need constant supervision. 7. Give children jobs to help with cleanup. Children love to knead and shape dough. Allow plenty of time for the children to do as many tasks as possible. Combine 1 cup flour, sugar, salt, and undissolved dry yeast in a large bowl. Mix thoroughly. Add margarine. Add very hot water gradually to dry ingredients. Beat 2 minutes. Add 1 cup of flour or enough to make a thick batter. Beat 2 or 3 minutes. Stir in enough additional flour to make a soft dough. Cover bowl tightly with plastic wrap. Let rise in a warm place for 45 to 60 minutes. Stir dough down and turn out onto heavily floured surface. After washing children's hands, flour them and have them knead dough until it is smooth. Shape dough into one large oblong or let the children experiment with different shapes and sizes. Try pretzels, animals, letters, numbers, or holiday shapes. Place on a greased baking sheet and let rise (40 to 50 minutes for a large loaf, less time for small shapes). Bake at 400 degrees Fahrenheit (40 minutes for a large loaf, 8 to 10 minutes or until golden brown for small shapes). Give a tortilla to each child. Fill with cooked ground beef, cheese, and/or vegetables. Reprinted with permission from the National Network for Child Care - NNCC. Van Horn, J. E. (Ed.) and L. Horning (Ed.) (1995). Cooking with children: kids in the kitchen. In Todd, C.M. (Ed.). *Family child care connections* 4(6). Urbana, IL: National Network for Child Care at the University of Illinois Cooperative Extension Service. The most beautiful dyes for Easter eggs come from foodstuff you probably already have in your kitchen. I have been delighted with the results of the colors I have tried and my friends have been thrilled to receive them as springtime gifts. The colors are very unusual -- gentle, earthy, soft, and very vibrant, without being harsh like the artificial dyes -- and when I tell people the colors come from plant dyes, they always want to know the origin of each color. To color these eggs, you boil the eggs with the dyestuff, rather than boiling the eggs separately and then dying them. 1. Put raw, white-shelled, organically-raised eggs in a single layer in a pan. Cover with cold water. 2. Add a little more than a teaspoon of white vinegar. 5. Quickly check the eggs for color by removing them from the dye liquid with a slotted spoon. * Use filtered or distilled water. Chlorine and other chemicals will work against the dye, making it less intense. Buy distilled water or use your own filtered water. * Blot the eggs dry or allow them to air dry, as for some colors the dye will rub off while still wet. On the other hand, if you wish to make a white pattern on the egg, you can rub off some of the dye for some colors immediately after cooking. Read more about natural dyes for Easter eggs at [http://www.debraslist.com/food/aboutcoloringeggs.html]. Hailed as "The Queen of Green" by the New York Times, Debra Lynn Dadd has been a consumer advocate for products and lifestyle choices that are better for health and the environment since 1982. Visit her website for 100s of links to 1000s of nontoxic, natural and earthwise products, and to sign up for her free email newsletters. For generations, Thomas the Tank Engine and all of his friends have been charming young children, along with their parents. The antics of mischievous cars and the lessons about positive behavior and character traits have helped kids laugh and learn for over seventy years. If you have children, you have probably watched as Thomas and the other engines work hard to earn the highest of praise from their beloved Sir Topham Hat – to be called a Really Useful Engine. Now you can bring Thomas home to your little ones; the Thomas the Tank Engine pedal train will quickly become their new best friend as they pretend and grow together. This top-quality ride-on toy will let your preschoolers live out their fantasy in style. 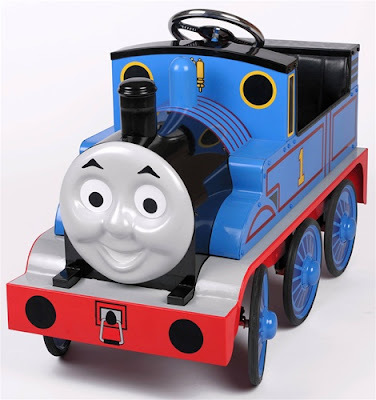 Made from heavy-gauge steel, the Thomas pedal train features an adjustable pedal assembly, lead-free and rust-proof paint, and high-traction tires for safety. While costlier than your typical ride-on toy, this pedal train is built to last, as well as to keep your child safe during outdoor play. Recommended for children ages 3 to 6, this toy exceeds all U.S. safety regulations and will last for years of tough use. Perfect for home use, the Thomas the Tank Engine pedal train is also ideal for a day care or preschool setting. You can find the Thomas the Tank Engine pedal train at the lowest prices through A Kid Place. Our web site focuses on the highest quality educational toys and children’s furnishings without the high prices you will find at boutique children’s stores. You will find thousands of items by the top manufacturers for nursery and playroom furniture, waiting room toys, pretend play, puppet theaters, arts and crafts, and much more. Get ready for Spring and outdoor play with the Thomas pedal train and dozens of other whimsical and fun pedal vehicles. Whether you are old enough to remember the first Coke machines, back when a bottle of icy cold Coca-Cola cost only a nickel, or you are a fan or collector who specializes in vintage Americana, the American Retro coke machine is the perfect addition to your family room or patio area. For the enthusiast, here is a little bit of the history of the ubiquitous Coke machine. Coca-Cola was already the most popular American soft drink when the Coke machine first appeared on the scene in 1929. 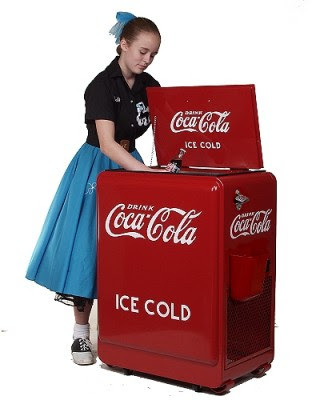 The original machine was a basic ice chest with the Coca Cola logo on it, manufactured by an Indiana company known as Glascock Bros. Manufacturing. It could be found in drug stores and malt shops everywhere; the 6-oz. bottles sold for 5₵ apiece. Throughout the 1930s, Glascock Bros. continued to manufacture their signature Coke machines; the smaller models were designed to fit on store counters, or they could be wall-mounted to economize on limited space. A larger, “standard” model was available on casters so that it could be moved easily; the cooler held crushed ice to keep the drinks cold and refreshing, in keeping with the “Ice Cold” label that appeared on every machine. In 1937, two companies – the Vendo company and Vendorlator Manufacturing Company – merged to form a single soda machine manufacturing firm. The resulting company produced over 5,000 coolers, which were installed at military bases and factories in keeping with Coca-Cola’s pledge to provide free soft drinks to all of the nation’s servicemen during wartime. The post-WWII Coke machines, in particular, are considered to be works of art and are highly prized by collectors. The first coin-operated machines featured white-over red units; thirsty customers would insert their nickel, then open the door and retrieve their bottled Coke. With the American Retro Coke Machine, you can bring a little piece of vintage Americana into your own home. These exquisitely designed models are authentic down to the last detail and create the perfect conversation piece for your family room, bar area, or outdoor patio. You can find these vintage-style Coke machines, along with other great products from American Retro, at A Kid Place.